Debugging such executions can however be noisy in Visual Studio: commonly-used settings cause Visual Studio to break on each exception the policy handles. This article describes how a better experience debugging with Polly in the mix can be achieved by configuring Visual Studio debugger settings to break on Just My Code, to continue on so-called user-unhandled exceptions, and by specifying whether to break depending on which module throws the exception. First, you likely want to set the debug setting 'Just My Code'. This tells the VS debugger that you don't want to step through the code of the .NET implementation, nor of third party libraries you may be using - this includes Polly and third-party libraries you might be calling through Polly. Many have commented that Visual Studio's terminology user-unhandled is confusing. It does not mean the exception is unhandled. It also does not mean your user code won't handle the exception (once code flow has been allowed to continue, via the debugger controls). Rather, the debugger may break saying an exception is user-unhandled if the exception is first handled by non-user code. 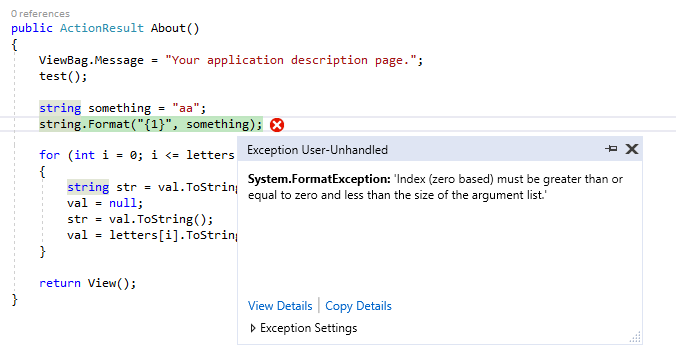 Reference: https://blogs.msdn.microsoft.com/visualstudioalm/2015/01/07/understanding-exceptions-while-debugging-with-visual-studio/. If an exception is going to be handled by non-user code (for example a Polly policy), why then does the debugger (by default) break for it? It does this (per MSDN) so that you still have a chance to see the exception at source where it occurred - it is an exception, after all. However, this behaviour is what can make step-debugging with Polly noisy. For instance, if you have five retries configured and all fail, step-debugging this will break all six times (first try and five retries) the exception is thrown. 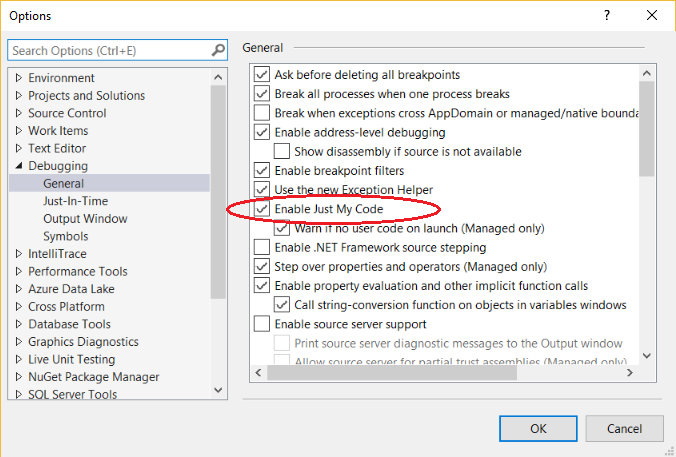 To reduce the noise when step-debugging exceptions handled by a Polly policy, in both Visual Studio 2015 and 2017 you can adjust debugging settings to specify that you do not want to break when a given exception type is 'user-unhandled'. For example, when using a Polly policy to handle System.Io.IoException, you might specify not to break when this is 'user-unhandled' (as we learnt above, this includes 'handled by Polly'). This approach can have limitations, in that you might want the debugger not to break on IoExceptions on that particular code path; but you might still want it to break if those exceptions are thrown elsewhere. Visual Studio 2015 does not give you that level of control, but Visual Studio 2017 comes closer to doing so. With Visual Studio 2017, you can specify to break or not break according to conditions: for example according to which module is throwing. If for example you are using Polly to handle exceptions thrown by a third-party library or particular System. *.dll, you could use Visual Studio's fine control to specify that the debugger should not break when the exception is thrown by that library. However, if the exception was unexpectedly thrown elsewhere in your code, the debugger would continue to break. Another option to smooth debugging in earlier versions of Visual Studio is to specify that certain code is [DebuggerStepThrough] or [DebuggerNonUserCode]. One intended effect was that the debugger would not break on exceptions in code marked with these attributes. Polly's .Execute(...) overloads are marked with this attribute for this reason. As this issue explored, performance changes in Visual Studio 2015 meant this no longer worked out of the box - but can be re-enabled with registry hacks. We have not yet verified whether Visual Studio 2017 reverts to the original behaviour of not breaking on [DebuggerStepThrough] or [DebuggerNonUserCode], or still requires the registry hack. Breaking on a 'first-chance' (or user-unhandled first-chance) exception means that the debugger breaks at the first chance after the exception is thrown (if configured to do so), even if you do have a try/catch that will handle that exception. For completeness, an exception not handled by a try/catch is known as a 'second-chance' or 'last-chance' exception. If there is no code handling for 'second-chance' or 'last-chance' exceptions, the debugger will always break on them. Previous Post : Policy recommendations for Azure Cognitive Services Next Post : Why does Polly offer both non-generic and generic policies?